Everyone knows that children are a particular group among us who behave unpredictably and uncontrollably. Thus, when we aim UX design to children, it is hard to do user research. This paper includes the analysis of children’s characteristics and wants to help readers comprehend why children are hard to be researched and how to avoid making mistakes when they research kids. Gamification is a hot technique and has been used in various areas. Thus, we try to figure out if gamification is helpful in UX research. Based on the two research cases and analysis of gamification, gamification could be proved as an effective method to overcome children’s characteristics and help children focus on the assignments and express what is really in their mind. Finally, the paper includes possible limitations and problems of using gamification in UX research. Keywords- Children, research, psychology, UX design. Nowadays, more companies and designers have found a vast market for children and have begun to focus on children’s various needs. There are thousands of apps and furniture designed for children in recent years which come to the public’s knowledge and catch parents’ attention. As the research, the market of children app has reached $2.2 billion . However, designing for kids is a tough task. One of the most challenging parts of the design process is how to research children. Currently, there is not any matured method focusing on how to conduct research involving children, even for those professional designers. The main reason is that children are trying to study and control. Children’s behaviors are unable to comprehend correctly. During author’s working period in the company, we always use research methods designed for adults on children. Sometimes we made adjustments, sometimes not. Thus, maybe the data collected from this research is inaccurate and misleading, and which leads to a failure for the apps or products. Some other designers make some conclusions about their personal experience which is more like principles than methods. There is an idea claiming that UX research need to be organized in a familiar environment to children where they feel comfortable, which generally means visiting children in their homes or at school and making the necessary preparations to ensure that space is necessary for one’s research needs. Admittedly, those principles could be understood by us easily and could help us avoid apparent mistakes. However, it is enough to design a whole research process after reading the article. Before we talk about how to conduct UX research with children, we have to comprehend why it is so tight. In order to test the gamification is useful in UX research for children. This paper explains what is the gamification and how to use elements of gamification in other field. This section is important and tell you what you could use. Then the paper talks about UX (User experience) research. Because if we want to add gamification to UX research, we have to know about what is UX research at first and what is the problem of UX research for children currently. To figure out the problems, the paper analyzes the personality of children and try to find out what leads to the problems. Finally, this paper analyzes two research cases which use gamification on children in other fields. By analyzing those two researches, we make an analogy to the UX field and find how to add gamification to children in the process of UX research. User experience (UX) is a strange phenomenon: readily adopted by the human-computer interaction (HCI) community – practitioners and researchers alike – and at the same time repeatedly critiqued for being vague, elusive, ephemeral. The term ‘user experience’ is associated with a wide variety of meanings , ranging from traditional usability to beauty, hedonic, active or experiential aspects of technology use . The process of user experience design is divided into researching and designing. During the process of research, the designer researches the user and collects the relative data, especially when the designer believes the concept of User-Centered design. There are a few famous and approved research methods which help the designers collect data, such as interview, surveys, and group discussion. In this section, the highest priority requirement is accuracy. The fake data not only will lead the whole research to a wrong conclusion, but also take the design in a wrong direction, and of course, the product will fail eventually. Everyone knows children are uncontrollable, unpredictable and irregular, but most of them do not know why children behave in this way. I will analyze some universal psychologies of children and explain how it happens and how it relates to our UX research. Fearing unknown is the instincts for both children and adult, but children are influenced easily, and they always express their fear through behaviors. This fear is more apparent when children stay in an unfamiliar environment with strangers, which is called “Stranger anxiety.” Stranger anxiety is said to occur when infants or children feel uncomfortable or frightened when approached by someone they do not know . This anxiety could not be relieved, even their parents or someone they are familiar with are close to them. When children are in Stranger anxiety, some children will cry, shout, fight with others or cannot say anything. Beside strangers, the content of research is all unfamiliar with children. Most children do not have this kind of experience, so they do not know what will happen a few minutes later. In this situation, stranger anxiety shows up frequently. Children begin to imitate after when they are born. During UX research we should pay attention to whether the kid is just following what other kid’s behavior. For example, when a child said he likes a cartoon, it is because he actually likes this cartoon or just because the prior kid said he likes this cartoon. It is a real case, author designs two kinds of UI with entirely different styles. When researchers ask a group of kids to pick their favorite style, most of them raise their hands in the first style, and only two kids choose the second one. Researchers believe they had gotten the result. However, when author asks a kid for the reasons why she chooses the first one in private, she told that she does not want to be the minority. Children are distracted easily under exciting and strange environment. This is why children are trying to be controlled. The environment during the UX research is strange to children. There are various distractions for children including strange researchers, new technical devices and staying in a new classroom. The distraction becomes more dramatic when they operate a smart device. Children would be attracted by the animation, the icons and buttons which are not related to the object. A large number of researches testify the attraction of electronic device. I have seen a 7-year-old kid watch the welcome animation repeatedly for more than four times, during a 5-minutes practical test. This scene happens even I just stood behind him. I cannot imagine what will happen if I give them enough freedom to operate the APP by himself. In this situation, finding appropriate interviewees is a crucial process. Our research target should be familiar with electronic devices and value the context in the device rather than the device itself. Gamification can be described as the integration of game mechanics into a non-game environment in order to give it a game-like feel . These mechanics are used in the different area to motivate people’s engagement. There are two definitions which could help us comprehend the concept. Gamification is defined as the use of game design elements in non-game contexts . Gamification refers to a process of enhancing a service with affordances for gameful experiences in order to support user’s overall value creation . In the field of UX research, designers intend to add gamification elements to the process of research, which motivates interviewees to engage in the research. Those gamified elements are combined with each other and form an integral system. However, when people design a gamified system, they need to think about those elements separately and find which are suitable for the object. If we consider the process of conduct UX research as service design, gamification likes a tool which could be used to improve the experience with children and encourage them to create or express their ideas. Gamification has been used in the industry to improve the degree of participation for many years and tested its’ effectivity. Gamification is not a method designed for children. It could be used for all kinds of people. However, after analyzing a large number of cases, children are more likely to be affected. For example, the apps designed with gamification will have more opportunity to catch children’s curiosity and make them addicted to the apps. Gamification possesses numbers of elements such as narrative, rewards, competition, progress, feedback, challenge, collaboration, etc. Those elements interact with each other and motivate people from different directions. All in all, the whole stimulation could be distinguished from positive to the contrary and from emotional to cognition (Figure 1). 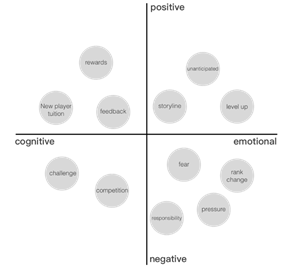 For example, the “level” system is a cognitive element, because it gives players a specific target during the playing and encourages players to achieve the target. Moreover, it is positive because it could quantify player’s endeavors and gives the player a powerful stimulation after a period of tasks. However, the “unanticipated” is a positive and emotional element. It makes a kid feel curious and would like to find new things. In the paper, I mention a few elements which are easily added to the process of research. By adding those elements, children’s behavior will become engaging and would like to express their real thoughts. What is the mean of “narrative”? It is similar to the storyline which includes the background, conflict and the end of the story. Everyone likes the story and will be attracted by the storyline, because the storyline makes people immersed in the world created by the storyteller. Liking the story is people’s instincts. When we were a little child, we began to love stories and always asked parents to use stories lull us to sleep. With us growing up, we began to be fascinated with the novel, theater, and movies. Our recreational life always is relative to the storyline, which is also strong evidence for the feasibility of using storyline to attract people. During the UX research, narrative means the background of the whole research to the children, which means designing a complete story which includes every process in the research, including the introduction of the what UX research is, how to conduct the research and why they should do this. Kids do not know what the UX design is and what researches are, so children must be confused when they are asked to take the research. In most cases, the school tells children that is a survey needing them to take part in and help the company improve their products; sometimes worse, teachers ask kids to follow what researchers’ requirements and do not explain anything. As we mentioned above, children should not be forced to do anything, which may cause their rebellion. As the most significant part of the research, kids’ feeling should care. Thus, as the organizer of the research, we have the responsibility to inform children what they are going to participate. Researchers need to find reasons and motivation for kids engaging in the research. Storyline much is helpful. Engaging in an attractive story, children can understand the assignments thoroughly and keep interesting in the activities. Looking for a fascinating game, the protagonist always is chosen by the fortune with strong talent and strength, which means everyone wants to become the special one among others. During the research, why don’t tell children the school chooses them, and they are excellent in various aspects which are the only group of people could complete the assignment. In addition, children could be told the engagement with them is essential and could help the company become stronger. Trying to give some responsibility during the story to them could make them feel being trusted and take the research seriously. The narrative is not an independent element. It combines with other gamification elements to make the whole story attractive. Such the challenge, rewards, and competition, all elements connect with each other and form the storyline. The challenge in this section likes giving children a specific assignment which could not achieve easily. It helps children focus on the target of the research rather than being attractive by other exciting stuff in the surrounding. Everyone likes to play video games, just because the player cannot achieve the task smoothly. If everyone could pass the game without any failure, no one will engage in the game and have a good experience. In the process of research, especial when there is a group activity, overcoming a challenge in front of all your friends could give you more sense of achievement. On the other side, it is not easy to design the challenge. The challenge cannot be too easy or too harsh. Kids will not attain any achievement if it is too easy. However, if it is too tricky, children will feel frustrated and do not want to try again. So keeping balance is the critical point. Competition and cooperation also play a significant role in a game. A single player game will be less attractive than an online game which could play with friends or some strangers. When players compete, defeating you rival definitely could give players many achievements; however, when players carry team members and finally achieve the assignment, the achievement will not be less than defeating the rivals. Human is a social animal who get satisfaction through communication with each other. Competition and cooperation are a kind of communication which make people feel pleasure during the game. Typically, the feedback includes two parts, the reaction of behaviors and the rewards after finishing a task. As for the first part, it does not mean we should give a reaction to each behavior. However, when kids feel confused or finish a behavior, we should give a reaction to encourage kids to continue the task or be confident to finish the tasks. This kind of feedback could be a simple action such as an expression on eyes or nod. Children in a strange environment always feel ferried, confuse and do not know what to do. Such actions help children feel comfortable and be brave to express their ideas. Moreover, as for rewards is much more comfortable, providing a favorite item as a reward to the winner who completes the assignment could encourage children to try their best. This motivation will become more potent if kids much love the rewards. There is strong evidence proving the feasibility of gamification, element as feedback, engaging children to participate a lab study. Let look the conclusion firstly, the use of gamification increased our study task completion rates from 73% to 97% . This data is enough to prove the effect. In order to collect the clear data, the study includes two comparing study. One used gamification and another one does not use. During this experiment, researchers just use two gamified elements, rewards and scores. As for scores, researchers add a scoring system to the study task applications. For each gesture that was drawn or target that was touched, children received points. And for prize, At the end of the session, children could “turn in” their points for physical prizes . The point and prize could be classified as feedback which are attractive for children. To win the prize, children try their best the complete the tasks comparing the first study without prize and scores. The score motivates children at every time they finish an action. However, there is a point which needs our attention. Besides the rewards, competition dons not make sense in this study. Children only need to focus on their task, because they do not need to compete with other children to get the prize. The only criticism to win the prize is to complete the tasks. I do not know whether the rate will increase if we add the competition is the study. The second case proves the feasibility of gamification with a study in which researchers compare the student’s participation and proactive behaviors in gamified class and non-gamified class. The outcome is also very positive. Students considered the gamified instance to be more motivating, exciting and more accessible to learn as compared to other courses . This study also includes a distinct comparing group, the courses without gamification. In the course with gamification, several elements of gamification are included. For example, students have their own profiles which are different from others. This setting makes students feeling special and would like to devote to it. And researchers also divide the whole exercise into several little section, students could get point and level up if they complete a chapter of exercise. After finishing different tasks, students could get different bonuses. In order to compare the outcome of two groups, researchers consider participation, the number of the slide download and the grade as the criticism, and then researchers find that the gamified course shows notable gains regarding attendance, participation and material downloads, which suggests improved engagement and diligence, which means the elements of gamification play an essential role in the first course and help student be willing to attend the class. Gamification is an effective method to motivate children to engage in the UX research and improve the accuracy of data collected. When you need to design a process of UX research to children, you could divide the whole process into numbers of steps (figure 2). Each step could be described as a circle, and every circle represents a task during the UX research. In the circle, researchers need to tell the story, give assignments, observe interviewees’ behavior and give feedback. Telling story means researchers inform interviewees of the background of the research and help interviewees immerse in the research. Giving assignment means interviewees should have a specific target which motivates them to finish the behaviors. Behavior is the real process of UX research, and interviewers will collect information in this section. Then interviewees will be given feedback which relates to their behavior. During each step, research could choose what elements of gamification they need and add it to this step. Although the effectiveness of gamification has been proved, several elements could influence the accuracy of the data from the UX research. What gamified elements are chosen and how to combine those elements into a complete system are the main problems. The gamified elements should be relative to the object of the research, which is the significant section deciding the outcome of the research. Admittedly, the reward is a favorite element which has been testing its availability. However, I do not think rewards could be attractive in every situation. A large number of researchers know the gamification, but there are hardly designers try to add gamification to the UX research. It is because the process of adding the gamified methods to research is time-consuming. We cannot find a universal method which could be applied to all kinds of research. Thus, every time we intend to do UX research, we need to take a significant amount of time to design the gamified mechanism. In a company, the resources of time and manpower are precious, whether the result of research is worthy compared with the expense is what the leader of the company need to consider. Also, whether the gamification could affect success also is determined by some other aspect, such as how to conduct the methods. Although gamification has many limitations, I have reasons to believe that usage of gamification in a UX research will become widespread in the future. “Global Kids Mobile Game Revenue 2017 | Statistic.”, https://www.statista.com/statistics/06130/ hildren-mobile-game-revenue-global/. University of Pittsburgh Office of Child Development, “stranger anxiety”. Deterding, S., Dixon, D., Khaled, R., & Nacke, L. (2011). From game design elements to gamefulness: Defining gamification. In MindTrek ‘11 Proceedings of the 15th International Academic MindTrek Conference: Envisioning Future Media Environments(pp. 9–15). ACM. Huotari, K., & Hamari, J. (2012). Defining gamification: A service marketing perspective. In International Academic MindTrek Conference (pp. 17–22). New York, USA. Cristina Ioana Muntean, “Raising engagement in e-learning through gamification”, 6th International Conference on Virtual Learning ICVL, 2011.